Both the Ford Foundation and the Rockefeller Foundation were heavily involved. One key leader was Norman Borlaug, the "Father of the Green Revolution", who received the Nobel Peace Prize in 1970. He is credited with saving over a billion people from starvation. The basic approach was the development of high-yielding varieties of cereal grains, expansion of irrigation infrastructure, modernization of management techniques, distribution of hybridized seeds, synthetic fertilizers, and pesticides to farmers. The term "Green Revolution" was first used in a speech on 8 March 1968 by the administrator of the U.S. Agency for International Development (USAID), William S. Gaud, who noted the spread of the new technologies: "These and other developments in the field of agriculture contain the makings of a new revolution. It is not a violent Red Revolution like that of the Soviets, nor is it a White Revolution like that of the Shah of Iran. I call it the Green Revolution." It has been argued that "during the twentieth century two 'revolutions' transformed rural Mexico: the Mexican Revolution (1910–1920) and the Green Revolution (1950–1970)". With the support of the Mexican government, the U.S. government, the United Nations, the Food and Agriculture Organization (FAO), and the Rockefeller Foundation, Mexico made a concerted effort to transform agricultural productivity, particularly with irrigated rather than dry-land cultivation in its northwest, to solve its problem of lack of food self-sufficiency. In the center and south of Mexico, where large-scale production faced challenges, agricultural production languished. Increased production meant food self-sufficiency in Mexico to feed its growing and urbanizing population, with the number of calories consumed per Mexican increasing. Technology was seen as a valuable way to feed the poor, and would relieve some pressure of the land redistribution process. Mexico was the recipient of Green Revolution knowledge and technology, and it was an active participant with financial support from the government for agriculture as well as Mexican agronomists. Although the Mexican Revolution had broken the back of the hacienda system and land reform in Mexico had by 1940 distributed a large expanse of land in central and southern Mexico, agricultural productivity had fallen. During the administration of Manuel Avila Camacho (1940–46), the government put resources into developing new breeds of plants and partnered with the Rockefeller Foundation. In 1943, the Mexican government founded the International Maize and Wheat Improvement Center (CIMMYT), which became a base for international agricultural research. Agriculture in Mexico had been a sociopolitical issue, a key factor in some regions' participation in the Mexican Revolution. It was also a technical issue, enabled by a cohort of trained agronomists, who were to advise peasants how to increase productivity. In the post-World War II era, the government sought development in agriculture that bettered technological aspects of agriculture in regions that were not dominated by small-scale peasant cultivators. This drive for agricultural transformation would have the benefit of keeping Mexico self-sufficient in food and in the political sphere with the Cold War, potentially stem unrest and the appeal of Communism. Technical aid can be seen as also serving political ends in the international sphere. In Mexico, it also served political ends, separating peasant agriculture based on the ejido and considered one of the victories of the Mexican Revolution, from agribusiness that requires large-scale land ownership, irrigation, specialized seeds, fertilizers, and pesticides, machinery, and a low-wage paid labor force. The government created the Mexican Agricultural Program (MAP) to be the lead organization in raising productivity. One of their successes was wheat production, with varieties the agency's scientists helped create dominating wheat production as early as 1951 (70%), 1965 (80%), and 1968 (90%). Mexico became the showcase for extending the Green Revolution to other areas of Latin America and beyond, into Africa and Asia. New breeds of maize, beans, and wheat produced bumper crops with proper inputs (such as fertilizer and pesticides) and careful cultivation. Many Mexican farmers who had been dubious about the scientists or hostile to them (often a mutual relationship of discord) came to see the scientific approach to agriculture as worth adopting. In 1960, the Government of the Republic of the Philippines with the Ford Foundation and the Rockefeller Foundation established the International Rice Research Institute (IRRI). A rice crossing between Dee-Geo-woo-gen and Peta was done at IRRI in 1962. In 1966, one of the breeding lines became a new cultivar, IR8. IR8 required the use of fertilizers and pesticides, but produced substantially higher yields than the traditional cultivars. Annual rice production in the Philippines increased from 3.7 to 7.7 million tons in two decades. The switch to IR8 rice made the Philippines a rice exporter for the first time in the 20th century. In 1961, India was on the brink of mass famine. [additional citation(s) needed] Norman Borlaug was invited to India by the adviser to the Indian minister of agriculture Dr. M. S. Swaminathan. Despite bureaucratic hurdles imposed by India's grain monopolies, the Ford Foundation and Indian government collaborated to import wheat seed from the International Maize and Wheat Improvement Center (CIMMYT). Punjab was selected by the Indian government to be the first site to try the new crops because of its reliable water supply and a history of agricultural success. India began its own Green Revolution program of plant breeding, irrigation development, and financing of agrochemicals. India soon adopted IR8 – a semi-dwarf rice variety developed by the International Rice Research Institute (IRRI) that could produce more grains of rice per plant when grown with certain fertilizers and irrigation. In 1968, Indian agronomist S.K. De Datta published his findings that IR8 rice yielded about 5 tons per hectare with no fertilizer, and almost 10 tons per hectare under optimal conditions. This was 10 times the yield of traditional rice. IR8 was a success throughout Asia, and dubbed the "Miracle Rice". IR8 was also developed into Semi-dwarf IR36. In the 1960s, rice yields in India were about two tons per hectare; by the mid-1990s, they had risen to six tons per hectare. In the 1970s, rice cost about $550 a ton; in 2001, it cost under $200 a ton. India became one of the world's most successful rice producers, and is now a major rice exporter, shipping nearly 4.5 million tons in 2006. CGIAR has responded, at least in part, to criticisms of Green Revolution methodologies. This began in the 1980s, and mainly was a result of pressure from donor organizations. Methods like Agroecosystem Analysis and Farming System Research have been adopted to gain a more holistic view of agriculture. Brazil's vast inland cerrado region was regarded as unfit for farming before the 1960s because the soil was too acidic and poor in nutrients, according to Norman Borlaug. However, from the 1960s, vast quantities of lime (pulverised chalk or limestone) were poured on the soil to reduce acidity. The effort went on for decades; by the late 1990s, between 14 million and 16 million tonnes of lime were being spread on Brazilian fields each year. The quantity rose to 25 million tonnes in 2003 and 2004, equalling around five tonnes of lime per hectare. As a result, Brazil has become the world's second biggest soybean exporter. Soybeans are also widely used in animal feed, and the large volume of soy produced in Brazil has contributed to Brazil's rise to become the biggest exporter of beef and poultry in the world. Several parallels can also be found in Argentina's boom in soybean production as well. There have been numerous attempts to introduce the successful concepts from the Mexican and Indian projects into Africa. These programs have generally been less successful. Reasons cited include widespread corruption, insecurity, a lack of infrastructure, and a general lack of will on the part of the governments. Yet environmental factors, such as the availability of water for irrigation, the high diversity in slope and soil types in one given area are also reasons why the Green Revolution is not so successful in Africa. A recent program in western Africa is attempting to introduce a new high-yielding 'family' of rice varieties known as "New Rice for Africa" (NERICA). NERICA varieties yield about 30% more rice under normal conditions, and can double yields with small amounts of fertilizer and very basic irrigation. However, the program has been beset by problems getting the rice into the hands of farmers, and to date the only success has been in Guinea, where it currently accounts for 16% of rice cultivation. After a famine in 2001 and years of chronic hunger and poverty, in 2005 the small African country of Malawi launched the "Agricultural Input Subsidy Program" by which vouchers are given to smallholder farmers to buy subsidized nitrogen fertilizer and maize seeds. Within its first year, the program was reported to have had extreme success, producing the largest maize harvest of the country's history, enough to feed the country with tons of maize left over. The program has advanced yearly ever since. Various sources claim that the program has been an unusual success, hailing it as a "miracle". The Green Revolution spread technologies that already existed, but had not been widely implemented outside industrialized nations. Two kinds of technologies were used in the Green Revolution and aim at cultivation and breeding area respectively. The technologies in cultivation are targeted at providing excellent growing conditions, which included modern irrigation projects, pesticides, and synthetic nitrogen fertilizer. The breeding technologies aimed at improving crop varieties developed through the conventional, science-based methods available at the time. These technologies included hybrids, combining modern genetics with selections. The novel technological development of the Green Revolution was the production of novel wheat cultivars. Agronomists bred cultivars of maize, wheat, and rice that are generally referred to as HYVs or "high-yielding varieties". HYVs have higher nitrogen-absorbing potential than other varieties. Since cereals that absorbed extra nitrogen would typically lodge, or fall over before harvest, semi-dwarfing genes were bred into their genomes. A Japanese dwarf wheat cultivar Norin 10 developed by a Japanese agronomist Gonjiro Inazuka, which was sent to Orville Vogel at Washington State University by Cecil Salmon, was instrumental in developing Green Revolution wheat cultivars. IR8, the first widely implemented HYV rice to be developed by IRRI, was created through a cross between an Indonesian variety named "Peta" and a Chinese variety named "Dee-geo-woo-gen". In the 1960s, when a food crisis happened in Asia, the spread of HYV rice was aggravated intensely. Dr. Norman Borlaug, who is usually recognized as the "Father of the Green Revolution", bred rust-resistant cultivars which have strong and firm stems, preventing them from falling over under extreme weather at high levels of fertilization. CIMMYT(Centro Internacional de Mejoramiento de Maiz y Trigo – International Center for Maize and Wheat Improvements) conducted these breeding programs and helped spread high-yielding varieties in Mexico and countries in Asia like India and Pakistan. These programs successfully led the harvest double in these countries. Plant scientists figured out several parameters related to the high yield and identified the related genes which control the plant height and tiller number. With advances in molecular genetics, the mutant genes responsible for Arabidopsis thaliana genes (GA 20-oxidase, ga1, ga1-3), wheat reduced-height genes (Rht) and a rice semidwarf gene (sd1) were cloned. These were identified as gibberellin biosynthesis genes or cellular signaling component genes. Stem growth in the mutant background is significantly reduced leading to the dwarf phenotype. Photosynthetic investment in the stem is reduced dramatically as the shorter plants are inherently more stable mechanically. Assimilates become redirected to grain production, amplifying in particular the effect of chemical fertilizers on commercial yield. HYVs significantly outperform traditional varieties in the presence of adequate irrigation, pesticides, and fertilizers. In the absence of these inputs, traditional varieties may outperform HYVs. Therefore, several authors have challenged the apparent superiority of HYVs not only compared to the traditional varieties alone, but by contrasting the monocultural system associated with HYVs with the polycultural system associated with traditional ones. Cereal production more than doubled in developing nations between the years 1961–1985. Yields of rice, maize, and wheat increased steadily during that period. The production increases can be attributed roughly equally to irrigation, fertilizer, and seed development, at least in the case of Asian rice. While agricultural output increased as a result of the Green Revolution, the energy input to produce a crop has increased faster, so that the ratio of crops produced to energy input has decreased over time. Green Revolution techniques also heavily rely on chemical fertilizers, pesticides, herbicides, and defoliants and rely on machines, which as of 2014 rely on or are derived from crude oil, making agriculture increasingly reliant on crude oil extraction. Proponents of the Peak Oil theory fear that a future decline in oil and gas production would lead to a decline in food production or even a Malthusian catastrophe. The world population has grown by about five billion since the beginning of the Green Revolution and many believe that, without the Revolution, there would have been greater famine and malnutrition. India saw annual wheat production rise from 10 million tons in the 1960s to 73 million in 2006. The average person in the developing world consumes roughly 25% more calories per day now than before the Green Revolution. Between 1950 and 1984, as the Green Revolution transformed agriculture around the globe, world grain production increased by about 160%. The production increases fostered by the Green Revolution are often credited with having helped to avoid widespread famine, and for feeding billions of people. There are also claims that the Green Revolution has decreased food security for a large number of people. One claim involves the shift of subsistence-oriented cropland to cropland oriented towards production of grain for export or animal feed. For example, the Green Revolution replaced much of the land used for pulses that fed Indian peasants for wheat, which did not make up a large portion of the peasant diet. Some criticisms generally involve some variation of the Malthusian principle of population. Such concerns often revolve around the idea that the Green Revolution is unsustainable, and argue that humanity is now in a state of overpopulation or overshoot with regards to the sustainable carrying capacity and ecological demands on the Earth. Although 36 million people die each year as a direct or indirect result of hunger and poor nutrition, Malthus's more extreme predictions have frequently failed to materialize. In 1798 Thomas Malthus made his prediction of impending famine. The world's population had doubled by 1923 and doubled again by 1973 without fulfilling Malthus's prediction. Malthusian Paul R. Ehrlich, in his 1968 book The Population Bomb, said that "India couldn't possibly feed two hundred million more people by 1980" and "Hundreds of millions of people will starve to death in spite of any crash programs." Ehrlich's warnings failed to materialize when India became self-sustaining in cereal production in 1974 (six years later) as a result of the introduction of Norman Borlaug's dwarf wheat varieties. M. King Hubbert's prediction of world petroleum production rates. Modern agriculture is largely reliant on petroleum energy. To some modern Western sociologists and writers, increasing food production is not synonymous with increasing food security, and is only part of a larger equation. For example, Harvard professor Amartya Sen wrote that large historic famines were not caused by decreases in food supply, but by socioeconomic dynamics and a failure of public action. Economist Peter Bowbrick disputes Sen's theory, arguing that Sen relies on inconsistent arguments and contradicts available information, including sources that Sen himself cited. Bowbrick further argues that Sen's views coincide with that of the Bengal government at the time of the Bengal famine of 1943, and the policies Sen advocates failed to relieve the famine. Some have challenged the value of the increased food production of Green Revolution agriculture. Miguel A. Altieri, (a pioneer of agroecology and peasant-advocate), writes that the comparison between traditional systems of agriculture and Green Revolution agriculture has been unfair, because Green Revolution agriculture produces monocultures of cereal grains, while traditional agriculture usually incorporates polycultures. These monoculture crops are often used for export, feed for animals, or conversion into biofuel. According to Emile Frison of Bioversity International, the Green Revolution has also led to a change in dietary habits, as fewer people are affected by hunger and die from starvation, but many are affected by malnutrition such as iron or vitamin-A deficiencies. Frison further asserts that almost 60% of yearly deaths of children under age five in developing countries are related to malnutrition. The strategies developed by the Green Revolution focused on fend off starvation and was very successful in raising overall yields of cereal grains, but did not give sufficient relevance to nutritional quality. High yield-cereal crops have low quality proteins, with essential amino acid deficiencies, are high in carbohydrates, and lack balanced essential fatty acids, vitamins, minerals and other quality factors. High-yield rice (HYR), introduced since 1964 to poverty-ridden Asian countries, such as the Philippines, was found to have inferior flavor and be more glutinous and less savory than their native varieties. This caused its price to be lower than the average market value. In the Philippines the introduction of heavy pesticides to rice production, in the early part of the Green Revolution, poisoned and killed off fish and weedy green vegetables that traditionally coexisted in rice paddies. These were nutritious food sources for many poor Filipino farmers prior to the introduction of pesticides, further impacting the diets of locals. Citing internal Foundation documents, Dowie states that the Ford Foundation had a greater concern than Rockefeller in this area. There is significant evidence that the Green Revolution weakened socialist movements in many nations. In countries such as India, Mexico, and the Philippines, technological solutions were sought as an alternative to expanding agrarian reform initiatives, the latter of which were often linked to socialist politics. The transition from traditional agriculture, in which inputs were generated on-farm, to Green Revolution agriculture, which required the purchase of inputs, led to the widespread establishment of rural credit institutions. Smaller farmers often went into debt, which in many cases results in a loss of their farmland. The increased level of mechanization on larger farms made possible by the Green Revolution removed a large source of employment from the rural economy. The new economic difficulties of smallholder farmers and landless farm workers led to increased rural-urban migration. The increase in food production led to a cheaper food for urban dwellers, and the increase in urban population increased the potential for industrialization. According to a 2018 paper, a 10 percent increase in the use of high-yielding crop varieties in developing countries in the period 1960–2000 led to increases in GDP per capita of approximately 15 percent. The spread of Green Revolution agriculture affected both agricultural biodiversity (or agrodiversity) and wild biodiversity. There is little disagreement that the Green Revolution acted to reduce agricultural biodiversity, as it relied on just a few high-yield varieties of each crop. There are varying opinions about the effect of the Green Revolution on wild biodiversity. One hypothesis speculates that by increasing production per unit of land area, agriculture will not need to expand into new, uncultivated areas to feed a growing human population. However, land degradation and soil nutrients depletion have forced farmers to clear up formerly forested areas in order to keep up with production. A counter-hypothesis speculates that biodiversity was sacrificed because traditional systems of agriculture that were displaced sometimes incorporated practices to preserve wild biodiversity, and because the Green Revolution expanded agricultural development into new areas where it was once unprofitable or too arid. For example, the development of wheat varieties tolerant to acid soil conditions with high aluminium content, permitted the introduction of agriculture in sensitive Brazilian ecosystems such as Cerrado semi-humid tropical savanna and Amazon rainforest in the geoeconomic macroregions of Centro-Sul and Amazônia. Before the Green Revolution, other Brazilian ecosystems were also significantly damaged by human activity, such as the once 1st or 2nd main contributor to Brazilian megadiversity Atlantic Rainforest (above 85% of deforestation in the 1980s, about 95% after the 2010s) and the important xeric shrublands called Caatinga mainly in Northeastern Brazil (about 40% in the 1980s, about 50% after the 2010s – deforestation of the Caatinga biome is generally associated with greater risks of desertification). This also caused many animal species to suffer due to their damaged habitats. "A good aggressive bunch of American agronomists and plant breeders could ruin the native resources for good and all by pushing their American commercial stocks… And Mexican agriculture cannot be pointed toward standardization on a few commercial types without upsetting native economy and culture hopelessly... Unless the Americans understand that, they'd better keep out of this country entirely. That must be approached from an appreciation of native economies as being basically sound". According to a study published in 2013 in PNAS, in the absence of the crop germplasm improvement associated with the Green Revolution, greenhouse gas emissions would have been 5.2–7.4 Gt higher than observed in 1965–2004. High yield agriculture has dramatic effects on the amount of carbon cycling in the atmosphere. The way in which farms are grown, in tandem with the seasonal carbon cycling of various crops, could alter the impact carbon in the atmosphere has on global warming. Wheat, rice, and soybean crops account for a significant amount of the increase in carbon in the atmosphere over the last 50 years. Most high intensity agricultural production is highly reliant on non-renewable resources. Agricultural machinery and transport, as well as the production of pesticides and nitrates all depend on fossil fuels. Moreover, the essential mineral nutrient phosphorus is often a limiting factor in crop cultivation, while phosphorus mines are rapidly being depleted worldwide. The failure to depart from these non-sustainable agricultural production methods could potentially lead to a large scale collapse of the current system of intensive food production within this century. 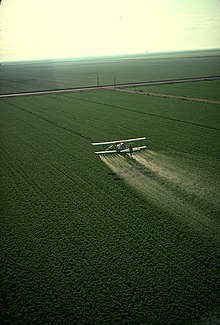 The consumption of the pesticides used to kill pests by humans in some cases may be increasing the likelihood of cancer in some of the rural villages using them. Poor farming practices including non-compliance to usage of masks and over-usage of the chemicals compound this situation. In 1989, WHO and UNEP estimated that there were around 1 million human pesticide poisonings annually. Some 20,000 (mostly in developing countries) ended in death, as a result of poor labeling, loose safety standards etc. Contradictory epidemiologic studies in humans have linked phenoxy acid herbicides or contaminants in them with soft tissue sarcoma (STS) and malignant lymphoma, organochlorine insecticides with STS, non-Hodgkin's lymphoma (NHL), leukemia, and, less consistently, with cancers of the lung and breast, organophosphorous compounds with NHL and leukemia, and triazine herbicides with ovarian cancer. The Indian state of Punjab pioneered green revolution among the other states transforming India into a food-surplus country. The state is witnessing serious consequences of intensive farming using chemicals and pesticides. A comprehensive study conducted by Post Graduate Institute of Medical Education and Research (PGIMER) has underlined the direct relationship between indiscriminate use of these chemicals and increased incidence of cancer in this region. An increase in the number of cancer cases has been reported in several villages including Jhariwala, Koharwala, Puckka, Bhimawali, and Khara. Environmental activist Vandana Shiva has written extensively about the social, political and economic impacts of the Green Revolution in Punjab. She claims that the Green Revolution's reliance on heavy use of chemical inputs and monocultures has resulted in water scarcity, vulnerability to pests, and incidents of violent conflict and social marginalization. A Greenpeace Research Laboratories investigation of 50 villages in Muktsar, Bathinda and Ludhiana districts revealed that twenty percent of the sampled wells had nitrate levels above WHO limits for drinking water. The 2009 study linked the nitrate pollution with high use of synthetic nitrogen fertilizers. Borlaug dismissed certain claims of critics, but also cautioned, "There are no miracles in agricultural production. Nor is there such a thing as a miracle variety of wheat, rice, or maize which can serve as an elixir to cure all ills of a stagnant, traditional agriculture." "some of the environmental lobbyists of the Western nations are the salt of the earth, but many of them are elitists. They've never experienced the physical sensation of hunger. They do their lobbying from comfortable office suites in Washington or Brussels...If they lived just one month amid the misery of the developing world, as I have for fifty years, they'd be crying out for tractors and fertilizer and irrigation canals and be outraged that fashionable elitists back home were trying to deny them these things". Although the Green Revolution has been able to improve agricultural output in some regions in the world, there was and is still room for improvement. As a result, many organizations continue to invent new ways to improve the techniques already used in the Green Revolution. Frequently quoted inventions are the System of Rice Intensification, marker-assisted selection, agroecology, and applying existing technologies to agricultural problems of the developing world. Current challenges for nations trying to modernize their agriculture include closing the urban-rural income gap, integration of smallholders into value chains, and maintaining competitiveness in the market. However, in low-income countries, chronic problems such as poverty and hunger cause agricultural modernization efforts constrained. It is projected that global populations by 2050 will increase by one-third and as such will require a 70% increase in the production of food. As such, the Second Green Revolution will likely focus on improving tolerances to pests and disease in addition to technological input use efficiency. ^ Farmer, B. H. (1986). "Perspectives on the 'Green Revolution'in South Asia". Modern Asian Studies. 20 (1): 175–99. doi:10.1017/s0026749x00013627. ^ Rowlatt, Justin (2016-12-01). "IR8: The miracle rice which saved millions of lives". BBC News. Retrieved 2016-12-05. ^ De Datta SK, Tauro AC, Balaoing SN (1 November 1968). "Effect of plant type and nitrogen level on growth characteristics and grain yield of indica rice in the tropics". Agron. J. 60 (6): 643–47. doi:10.2134/agronj1968.00021962006000060017x. Archived from the original on 2 December 2008. ^ Chibwana, Christopher; Fisher, Monica. "The Impacts of Agricultural Input Subsidies in Malawi". International Food Policy Research Institute. Retrieved October 7, 2016. ^ and Makoto Matsuoka, Sakamoto, Tomoaki (2004). "Generating high-yielding varieties by genetic manipulation of plant architecture". Current Opinion in Biotechnology. 15 (2): 144–47. doi:10.1016/j.copbio.2004.02.003. PMID 15081053. ^ Xu YL, Li L, Wu K, Peeters AJ, Gage DA, Zeevaart JA (July 1995). "The GA5 locus of Arabidopsis thaliana encodes a multifunctional gibberellin 20-oxidase: molecular cloning and functional expression". Proc. Natl. Acad. Sci. U.S.A. 92 (14): 6640–44. Bibcode:1995PNAS...92.6640X. doi:10.1073/pnas.92.14.6640. PMC 41574. PMID 7604047. ^ Silverstone AL, Chang C, Krol E, Sun TP (July 1997). "Developmental regulation of the gibberellin biosynthetic gene GA1 in Arabidopsis thaliana". Plant J. 12 (1): 9–19. doi:10.1046/j.1365-313X.1997.12010009.x. PMID 9263448. ^ Silverstone AL, Ciampaglio CN, Sun T (February 1998). "The Arabidopsis RGA gene encodes a transcriptional regulator repressing the gibberellin signal transduction pathway". Plant Cell. 10 (2): 155–69. doi:10.1105/tpc.10.2.155. PMC 143987. PMID 9490740. ^ Appleford NE; Wilkinson MD; Ma Q; et al. (2007). "Decreased shoot stature and grain alpha-amylase activity following ectopic expression of a gibberellin 2-oxidase gene in transgenic wheat". J. Exp. Bot. 58 (12): 3213–26. doi:10.1093/jxb/erm166. PMID 17916639. Archived from the original on 22 January 2009. ^ Monna L; Kitazawa N; Yoshino R; et al. (February 2002). "Positional cloning of rice semidwarfing gene, sd-1: rice "green revolution gene" encodes a mutant enzyme involved in gibberellin synthesis". DNA Res. 9 (1): 11–17. doi:10.1093/dnares/9.1.11. PMID 11939564. ^ Igbozurike, U.M. (1978). "Polyculture and Monoculture: Contrast and Analysis". GeoJournal. 2 (5): 443–49. doi:10.1007/BF00156222. ^ "Save and Grow farming model launched by FAO". Food and Agriculture Organization. ^ a b Bowbrick, Peter (May 1986). "A Refutation of Professor Sen's Theory of Famine". Food Policy. 11 (2): 105–24. doi:10.1016/0306-9192(86)90059-X. ^ a b Kilusang Magbubukid ng Pilipinas (2007). Victoria M. Lopez; et al., eds. The Great Riice Robbery: A Handbook on the Impact of IRRI in Asia (PDF). Penang, Malaysia: Pesticide Action Network Asia and the Pacific. ISBN 978-983-9381-35-1. Archived from the original (PDF) on 25 July 2011. Retrieved 8 August 2011. ^ Gollin, Douglas; Hansen, Casper Worm; Wingender, Asger (2018). "Two Blades of Grass: The Impact of the Green Revolution". doi:10.3386/w24744. ^ a b Davies, Paul (June 2003). "An Historical Perspective from the Green Revolution to the Gene Revolution". Nutrition Reviews. 61 (6): S124–34. doi:10.1301/nr.2003.jun.S124-S134. PMID 12908744. ^ Shiva, Vandana (March–April 1991). "The Green Revolution in the Punjab". The Ecologist. 21 (2): 57–60. ^ Stevenson, J. R.; Villoria, N.; Byerlee, D.; Kelley, T.; Maredia, M. (2013-05-13). "Green Revolution research saved an estimated 18 to 27 million hectares from being brought into agricultural production". Proceedings of the National Academy of Sciences. 110 (21): 8363–68. Bibcode:2013PNAS..110.8363S. doi:10.1073/pnas.1208065110. PMC 3666715. PMID 23671086. Retrieved 2013-08-28. ^ "'Green Revolution' Brings Greater CO2 Swings". www.climatecentral.org. Retrieved 2016-10-10. ^ Norman J. Church (2005-04-01). "Why Our Food is So Dependent on Oil". Resilience. Powerswitch (UK). ^ Pimentel, D. (1996). "Green revolution agriculture and chemical hazards". The Science of the Total Environment. 188 (Suppl): S86–S98. Bibcode:1996ScTEn.188S..86P. doi:10.1016/0048-9697(96)05280-1. ^ Dich J, Zahm SH, Hanberg A, Adami HO (May 1997). "Pesticides and cancer". Cancer Causes Control. 8 (3): 420–43. doi:10.1023/A:1018413522959. PMID 9498903. ^ Zahm, SH; Ward, MH (21 January 2011). "Pesticides and childhood cancer". Environmental Health Perspectives. 106 (Suppl 3): 893–908. doi:10.2307/3434207. JSTOR 3434207. PMC 1533072. PMID 9646054. ^ Pingali, Prabhu (January 2010). "Making " Agriculture for Development" work in the 21st century". Handbook of Agricultural Economics. Handbook of Agricultural Economics. 4: 3867–94. doi:10.1016/S1574-0072(09)04074-2. ^ Evenson, Robert (January 2010). "Total Factor Productivity Growth in Agriculture: The Role of Technological Capital". Handbook of Agricultural Economics. Handbook of Agricultural Economics. 4: 3769–822. doi:10.1016/S1574-0072(09)04072-9. Oasa, Edmund K (1987). "The Political Economy of International Agricultural Research in Glass". In Glaeser, Bernhard. The Green Revolution revisited: critique and alternatives. Allen & Unwin. pp. 13–55. ISBN 978-0-04-630014-2. Spitz, Pierre (1987). "The Green Revolution Re-Examined in India in Glass". In Glaeser, Bernhard. The Green Revolution revisited: critique and alternatives. Allen & Unwin. pp. 57–75. ISBN 978-0-04-630014-2. Wright, Angus (1984). "Innocence Abroad: American Agricultural Research in Mexico". In Bruce Colman; Jackson, Wes; Berry, Wendell. Meeting the expectations of the land: essays in sustainable agriculture and stewardship. San Francisco: North Point Press. pp. 124–38. ISBN 978-0-86547-171-9. Rowlatt, Justin (December 1, 2016). "IR8: The Miracle Rice Which Saved Millions of Lives". BBC News. Retrieved December 1, 2016. About the 50th anniversary of the rice strain.